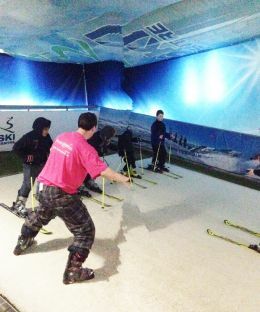 INDOOR SKI CENTRE DUBLIN ’s opened its doors to many new skiers of all ages over events around and on FIS World Snow Day. Events ran in partnership with CRYSTAL SKI HOLIDAYS and SNOW+ROCK… a special thanks to both for helping support our activities! Our aim was to promote the healthy fun of skiing to people of all ages, experience and backgrounds… and give everyone the opportunity to experience the fun of skiing and also raise money for a great children’s charity – Make-A-Wish Ireland. Over the events we raised over €5,000 so that Make-A-Wish Children can experience a dream ski trip - well done to all participants! And equally important we had lots of safe fun (no injuries)! Many events occurred over the week, we had schools in for lessons, trade events with Crystal Holidays, key travel journalist for all the major papers enjoyed a fun night and ski lessons on our non-stop slopes and hundreds of skiers participated in half-price ski lessons (all equipment etc. supplied)…and helped raise money for MAKE-A-WISH children’s charity… over 800 skiers in all. 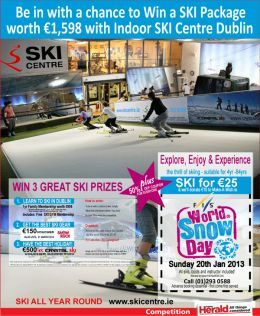 Additionally, we also ran a competition is national press (reaching over 893,000 readers) offering readers a chance to win a Year’s free FAMILY membership (ski-all year round)+free access to our unique ski gym + €500 voucher off a CRYSTAL Holidays + €150 Voucher for SNOW+ROCK… and raising awareness that people of all ages can enjoy skiing ALL YEAR ROUND!